After making a few batches of cold process soaps and waiting patiently for 3+ weeks while they cure, you are probably wondering if there's another way of making soap that doesn't require such a long waiting time. What if you need to make gifts for an upcoming party/holiday/special occasion, and there's not enough time left? What if you are like me and sometimes just don't have the patience to wait that long to use your new soaps? Then you should try hot process soap making - make it in the morning and use it in the afternoon! 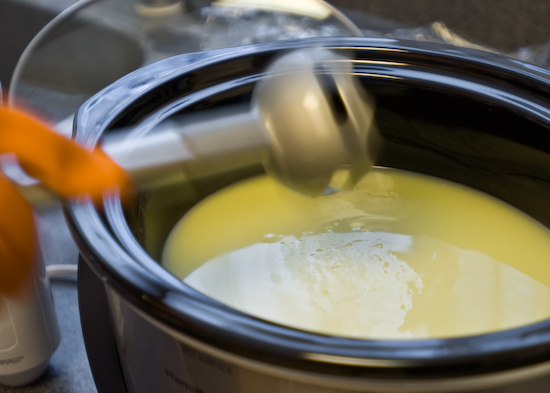 Hot process involves cooking the soap mixture in a slow cooker, double boiler, or stock pot for a couple of hours until it becomes neutral (heat speeds up the saponification process), and the soap is usable right away. Hot process soap making has other advantages over cold process as well. For one, it requires less fragrance oil, since it's added after the soap has become neutral and it's no longer affected by lye. 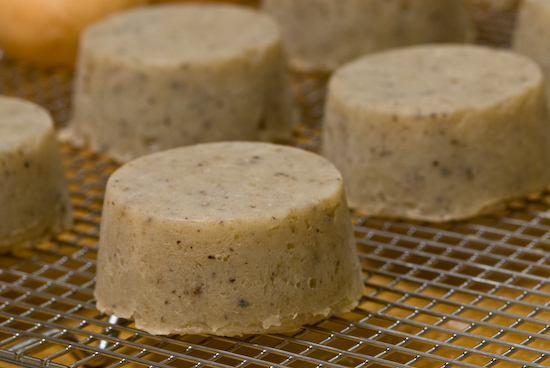 Also, if you are adding oatmeal/almond meal/corn meal or any additives that may settle to the bottom of cold process soap mixture, they will stay well mixed in hot process soap. There are also disadvantages - the texture of hot process soap can be spongy depending on the amount of water added, and usually is less fine than that of cold process soap. Sometimes hot process soaps have a marbled look without any colorants added (could be good or bad depending on what you had in mind). Also it's harder to fill smaller molds with freshly cooked hot process soap due to its thick and goopy consistency (needs to be scooped with a spatula rather than poured) - if not packed firmly the finished soap may have holes on the surfaces. All in all, both hot and cold processes have their places in soap making, and I have enjoyed doing both. Caution: do NOT use nonstick, aluminum, cast iron, or tin pots/pans, containers, or utensils because they will react badly with lye and ruin both the soap and the tool. Also wood is not recommended for repeated use because over time the wood will eventually break down from coming into prolonged contact with lye. 2. 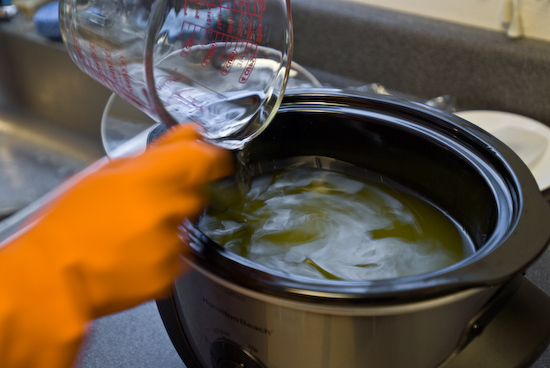 Weigh the liquid oils - pour 18oz of olive oil and 1 oz of castor oil into the slow cooker. After the solid fats are weighed and melted they’ll be added to the liquid oils. 5. Pour the lye into the water slowly and stir to dissolve - this generates a lot of heat and will normally give off fumes, but not so bad this time since I used some ice cubes (you can also sit the measuring cup in a cold water bath in the sink). 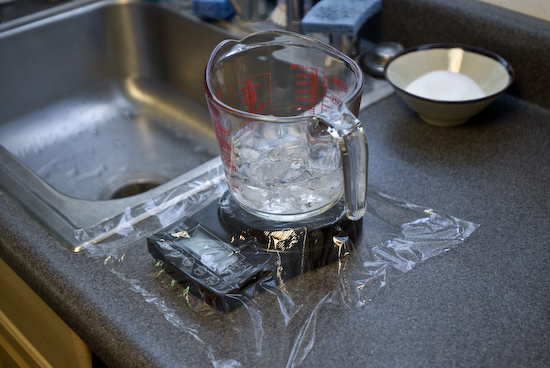 Set aside the lye water to cool. Note: never pour water into lye as this will cause a strong reaction and the splash/eruption can incur serious injuries. 6. Weigh the solid fats - scoop out 8 oz of coconut oil, 6 oz of palm oil, and 2 oz of shea butter into the other 32 oz glass measuring cup. 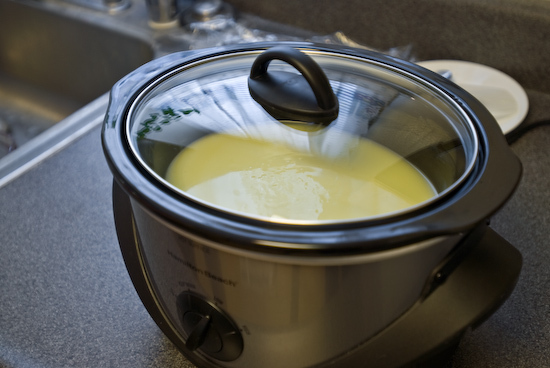 Melt the oils in the microwave - start with 1 min, then 30 second increments if needed. 7. 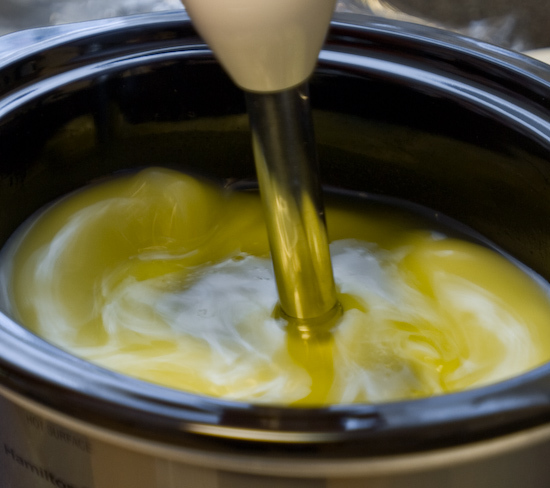 Pour the melted solid fats into the olive oil and castor oil in the slow cooker and mix them together. 8. Pour the lye water slowly and carefully into the oil while stirring. 9. Use the stick blender to stir the soap mixture until it reaches a thin pudding or gravy like consistency - when you lift the stick blender out of the soap mixture, the drippings should leave patterns on the surface of the mixture instead of disappearing completely. Another way to confirm the soap mixture has “traced” is to check it’s temperature - if it has risen a couple of degrees Fahrenheit, you are there (this is a great tip from the book “Smart Soapmaking” by Anne L. Watson). I usually stop the stick blender every 5-10 seconds to check the consistency. This process may take less than a minute or a few minutes - every batch is a little different so watch the soap mixture closely to gauge the status. 10. Once the soap mixture has traced, set the temperature on "low", put the lid on and take a break. 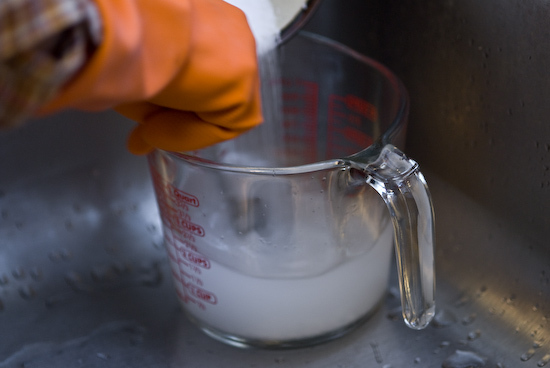 After 15 minutes, check to make sure that the soap mixture has not separated into oil and lye water. If separation does occur, mix them back together with a spatula. 11. Check again in another 20-30 minutes. The outside edge of the soap mixture starts to turn translucent and this process continues towards the center. 12. When a lot of the soap mixture has turned translucent, stir with a spatula to mix and let it cook some more. Stir again in 20-30 min. 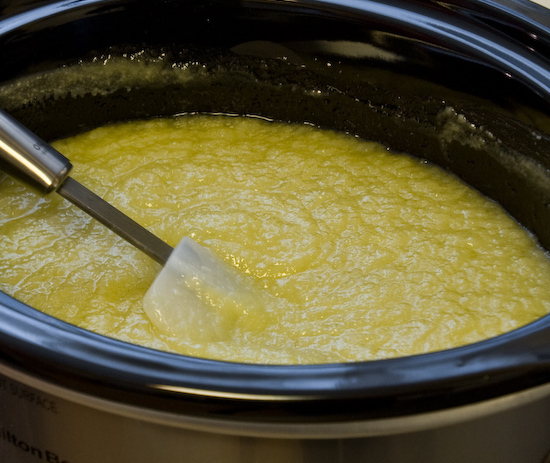 At some point the mixture looks like apple sauce. You may notice a layer of what looks like oil floating on the surface - it's actually the glycerin produced during the soap making process. Simply mix it back into the soap mixture. 13. After 1.5 -2 hours of cooking and stirring, the soap mixture now has a Vaseline like consistency. The oils and lye have fully saponified and the soap is now neutral. Turn off the slow cooker. 14. It's time to add the almond meal and the fragrance oil. Add 5-6 tbls of almond meal into the soap and mix well with a spatula. Then add 1 tbl of intense almond fragrance oil and mix well. I don’t like strong fragrances so generally 1-2 tbls of FO for every 2 lbs of oils seems to work well for me. Hot process soap requires less FO than cold process soap since the lye is already neutralized by the time FO is added. Adjust the amount to your liking. Also note that FOs tend to vary in strength depending on the scent, and quality can also vary from vendor to vendor. I recommend buying small quantities (many suppliers offer 1-2 oz bottles so you can sample) and test them before making a large purchase. 15. Scoop the soap into the mold of your choice, and bang the mold against the counter a few times while you are filling it to make sure the thick soap fills in all the edges and corners, otherwise you may end up with holes and crevices on the surfaces. You need to work quickly with hot process soap, since as it cools a skin forms on the surface which makes it hard for additional soap to stick to it. It's almost impossible to get a smooth surface on the top with hot process soap, so normally you would trim it after unmolding. In my case the top surface of the soap "muffins" will become the bottom and I like the rustic look, so I left it untrimmed. 16. Once the soap cools down and is firm to the touch, remove it from the mold and cut into pieces. You may want to trim the uneven side for a better look, or leave it for a rustic appeal. The soap can be used immediately since it is already neutral, unlike cold process soaps fresh out of the mold. For longer lasting and harder bars, let them dry for a couple of weeks. If you are too excited to wait however, just grab one and start scrubbing :-)! My "almond muffins" smelled and looked so delicious - I had to summon all my strength to refrain from taking a bite! Since there are no preservatives in these soaps, they’ll eventually go bad. Store them in a cool and dry place away from direct sunlight, and use within a year or so (six months in hot and humid areas). 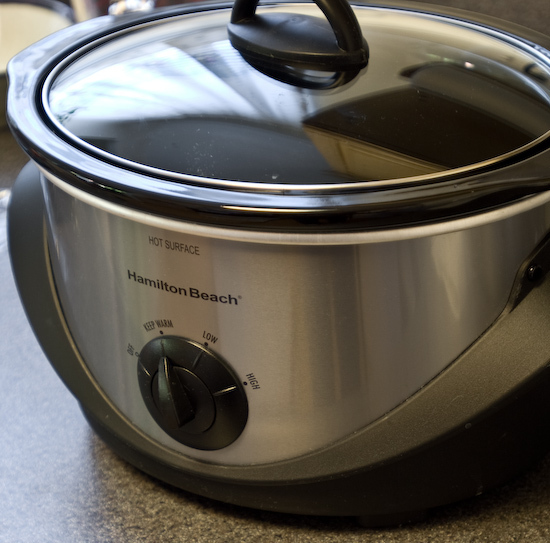 To clean up after making hot process soap, fill the slow cooker bowl with water and let the soap residue dissolve, then rinse. With your goggles and gloves on, wipe everything else down with towels/paper towel then wash with dishwashing liquid and warm water. tina - many thanks for posting up all your helpful tips and exeriences with soap making! i can't wait to start experimenting. hopefully i won't knock on your door too much and pester you questions happy soaping!! Marie, ask me questions any time :)! Wow, I've never tried soap making before but you make it look doable. Maybe one of these days I'll get up and try it myself! Thanks. Gaga - I hope you give it a try :)! That's why I'm writing these articles - to demonstrate that it's not hard to do and that it's fun :D! Tina - I just recently attended a soapmaking workshop by Kevin Dunn, and we made cold-process soap in 2 hours that was completely neutralized and solidified. I used within the week; it was perfectly set up and needed no extra curing - though I'm sure it wouldn't have hurt, only made the soap harder. It lathered up wonderfully! I think part of the difference is we used much less water in our lye - when you have less to start with, it cures much faster (since curing is all about removing moisture content). 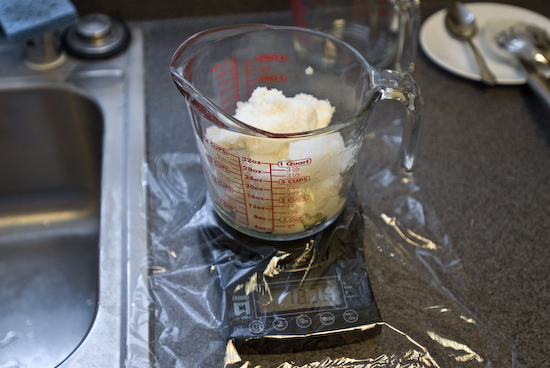 Also, with lower moisture content in your original recipe, the layers should not separate after trace. There is a little information on his website (www.cavemanchemistry.com) and he also has a book "Scientific Soapmaking" in revision right now. Regardless, I'm looking forward to experimenting around with both cold-process and hot-process soapmaking myself! M. Lawyer - I checked out Kevin Dunn's website and it's very interesting! At some point I'd like to study the chemistry behind soapmaking and understand it better. I'll try making the next batch of soap with less water and see how it goes. How many oz of water did you use per 1 lb of oil/fats? can you please tell me how many soaps will it make with the given measurements? and oh! can we use aluminum molder since lye is already neutralized by the time we put the product in it? you see.. I will be making soap that has a certain fruit as an active ingredient. will I only replace the almond meal with it? and will I remove some oil (because heavens there are so many kinds of oil in here!) so that I can see the real effects from the fruit? I mean, I will be using this for our investigatory project. if I use too many oils, we might not get to see what can "that certain fruit" do to our skin. We might just get the smooth skin just because of the oil. And that might just ruin our experiment. get it? Booda, how many soaps you get depends on what size mold you use or how big you cut the pieces if you are using a box/pan/PVC pipe. 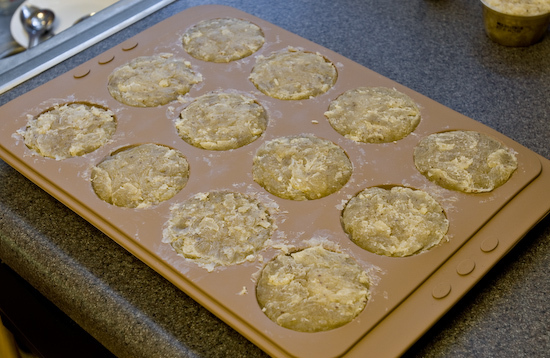 For the recipe in this article, I got 13 pieces using the silicone muffin pan. You should be able to use an aluminum molder with hot process soap, as long as the right amount of lye is used and the soap has been cooked long enough for it to fully neutralize. I've never made soaps with fruit in it so I'm not sure if the properties of the fruit will remain in the finished soap, but it doesn't hurt to experiment :). You can add it in place of the almond meal after the soap is fully cooked. Good luck and let me know how it goes! but I've already read the cold process. can I replace the almond meal with it, and the water with the fruit *decoction? I've been making soap ever since you wrote the first soap article, and I haven't wanted to make HP soap since I like the smooth molded finish of CP. However, I bought a bunch of dried lavender to mix in the CP soap and although it still looks cool, it turned brown. I'm going to try it in HP some time soon to see if it might retain the purple colour that way. There are so many things to try and only so much space to store curing soap. augh! booda, I would say try it and see what happens. From what I read it seems lye usually reacts with and destroys what is in the solution (e.g. scent, color, etc.) so not sure the beneficial properties of the fruit will remain in the finished soap. However if you make the soap without the fruit first then rebatch it (shred the soap, add some water or fruit decoction, melt it, then add the fruits) that might work better. It's best to try it and judge for yourself. Also I read that adding fruits to soaps will cause it to go bad faster, so you'll want to use it up quickly. Hope this helps. Jen, I'm so glad to hear that you are having fun making soap :). Yes lye usually destroy color and scent of flowers. Adding it to HP may work (I haven't tried yet) - let me know how it goes! Also you can try rebatching CP soap and add the lavender that way. After the CP soap has cured for a week or so - shred it, add some water, melt it in a double boiler or microwave (take care not to overheat - start on half power and 30 seconds at a time), then add the flowers. It's a bit of a hassle but worth trying at least once. Good luck! I have a question:Do you have to put the almond meal and fragrance oil in the hot process soap? Hi Adam, no you don't have to put the almond meal and the fragrance oil - they are optional additives. By leaving out the fragrance oil you will have an all natural unscented soap (fragrance oils contain synthetic ingredients), which is good for people with sensitive skin. The almond meal gives the soap exfoliating qualities which some people really like. Most of the soaps I make have FO added since I like the scents and sometimes I add oatmeal or almond meal for the scrubby effect but it is totally up to the soap maker :). so I tried making HP soap the other night and I'm not entirely sure I cooked it long enough. I don't have a slow cooker, so I did it double boiler style with a glass bowl in a pot of water on the stove. Anyway, might be worth giving one more try. This time the lavender flowers turned grass green instead of brown. I also made a batch (CP) a few weeks ago with powdered green tea. I was not surprised that the green turned brown (in fact, it seems to be a pretty dramatic oxidation reaction - the molded surface doesn't turn brown until after unmolding, and when you cut it up, the green cut surfaces turned brown after a couple of minutes) but it got shockingly dark. If my uncoloured soap reminds people of white chocolate, this stuff looks like dark chocolate. And the lather is brown, too, and although it rinses off, I'm worried I'll stain people's bathroom fixtures, so that was kind of a failed batch. I think I'll grate it up and sprinkle small quantities to speckle future batches a little, but not so much that it will stain the fixtures. Jen, thanks for sharing your notes on adding flowers and powdered green tea to cold and hot process soaps! Please keep trying so the rest of us can learn from your experiences :). Thanks! Alison, I'm so glad to hear that your CP soaps have been successes and that your family is benefiting from it :D! Yes you can replace the palm oil with other oils - just need to use a lye calculator (http://www.the-sage.com/calcs/lyecalc2.php) to make sure the right amount of lye is used for the combination of oils you are using. The other thing to consider is that palm oil contributes to the hardness of the soap, so if you prefer firmer soaps it would be better to substitute with oils that are solid at room temperature, such as coconut oil, shea butter, cocoa butter, or vegetable shortening (or tallow and lard if you don't mind animal fats). I read that too much coconut oil can be drying to the skin so try to keep it under 30% of the total oils. On the other hand I think it largely depends on personal preferences and experiences so I recommend you experiment a lot and figure out what works best for you. Good luck and happy soaping :)! wouldn't suggest using aluminum with hot process either. same reason the soap will still "burn" your skin if you use it before it sets. 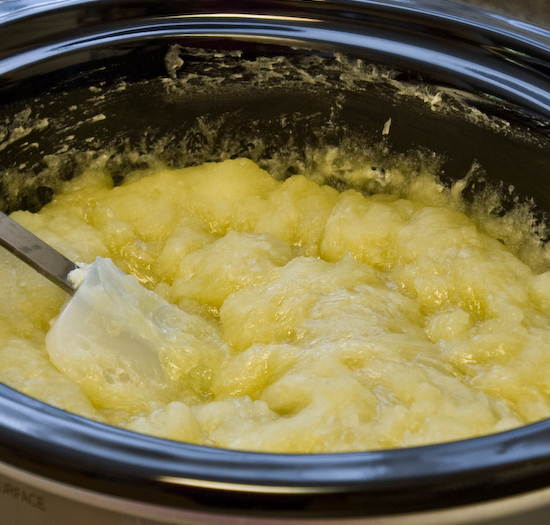 I always sample a small blob of soap scraped off the crock pot after i fill my mold and if i don't let it set up first, it seems to be lye heavy. so if you put it in an aluminum pan, it may still cause a problem. Jen, I share your struggles with green tea. I've used it in several batches and each one turned dark brown. Yes it will stain fixtures, my mother-in-law threw hers away because of it. It's still good soap, just a hassle. I did find that if you want to put tea leaves into the soap, run hot water over them first and squeeze them "dry". Then add them just at the end of cooking the soap. It will keep the leaves from dying the soap and if you want a green look you'll need to use dye. If you don't run them through water first, they will cause the soap to go brown. But from what I can tell, no matter when you add any tea solution, it will turn brown. Hope this helps. darn it, i used "drain pipe sosa powder". Please throw away the soap - there's no way to save this batch. Start fresh and wish you luck with the next batch using pure sodium hydroxide! Can any soap recipe be made with a slow cooker, or does it only work with certain recipes? I'd like to make shampoo bars with the slow cooker, but wasn't sure it would work. 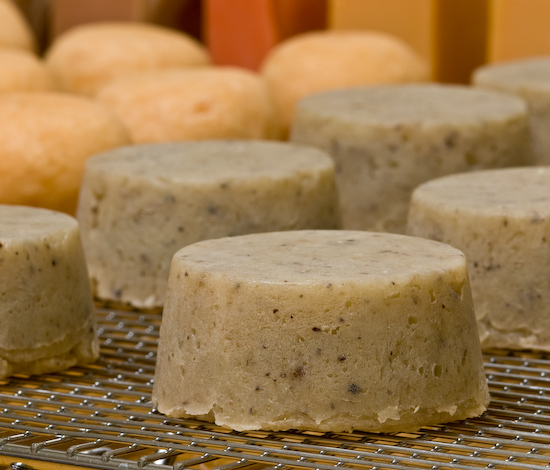 Evergreen, you should be able to make most soaps with a slow cooker, including shampoo bars which just require different oil combinations. Good luck! TINA: thank you for a great, detailed, and not scary description of the soapmaking process. JEN: i have made a cold process soap with our lavender (we have a lavender farm). It makes a great "scrubby" soap, even if the lavender turns brown after curing. The lavender flowers stick out from the bar of soap and work as a mild scrubbing agent. It is great for gardening or working hands. And most people think it's oatmeal, so the brown color doesn't bother them. Yesterday made my first batch of soap in the slow cooker. It has an autamatic setting which is what I put it on after the soap traced. Well! i left it for five mins and when i came back the soap had boiled over and out fo the crock pot! Scooped it all back but it refused to do anything else. IT stayed a little away from the edges and just sat. Not boiling , no nothing. so I added a little water and then heated it on slow and automatic alternately for hours and hours.. well at least five hours! Was like thickish apple sauce but never turned quite into mashed potatoes. Then at the end of my patience and as the edges had white dry pieces and lots of cry flakes but the middle refused to dry up totally. tasted and tasted and tasted hoping it would at least neutralise so I could use it as glakes to wash dishes.. but except for a crop of blisters on my tongue , no change. So took it out. bravely washed my hands with some of the flakes and put it into a mould. If I wash my hands its fie! When i taste it it still burns. Should I throw it away, let it sit for two weeks? Use it? HELP! Am bravely starting another batch following your pictures which I found today. I dont have a very accurate weighing machine, one of the old kitchen scales in gms. Hi Elaine, I'm so sorry to hear about your unfortunate experience with your first batch of hot process soap! It's hard to say if the soap is lye heavy without testing it with ph paper or phenolphthalein, so I would say be safe and throw it out. I've never tried the tongue test since I don't like tasting soap :-P. For the most part I've relied on using a good weigh/scale and having relatively accurate measurements. 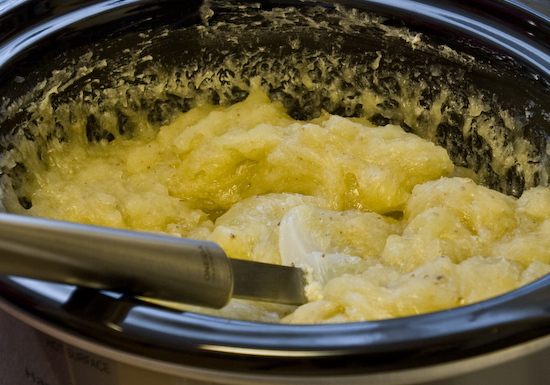 The consistency of the soap will vary depending on the amount of water you use - like apple sauce with more water, or like mashed potatoes with less water. I stir the soap once or twice during the cooking process to make sure it's well blended in case the glycerin floats to the top (doesn't always happen). Also I try not to fill the slow cooker more than two thirds full to avoid boil overs. Hope this helps! my slow cooker soap looks ok, except for alot of liquid seeping out of the bars.it is little small oily looking bubbles.i added melted beeswax at trace. We have recently purchased some dairy goats and have more milk than we can drink. I am interested in making soap with the extra milk we have. Can I just use goats milk instead of the distilled water? Tina, thank you for your advice in Feb. Have made another perfectly good olive oil soap after that. There is a question though, I am going to use vegetable fat, along witholive oil and coconut oil. The lye calculators dont give this as an ingredient so its difficult to know if the lye is right. May I use the same amout of lye as needed for , say, palm oil, or sunflower oil? It should work approx. You think? Three days ago, I made the very first olive oil soaps from your first blog. However I think I overtraced the oil and lye mixture as it was too thick to pour to the mold. I scooped it into the mold though. Can I use the soaps? Do you have any advise when this happens again? I had some problems before with overtrace and pouring into the mold and mine worked out fine, just not completely round on top. And Elaine, I have used goat milk, but I usually use it with a specific goat milk recipe. (I'm not Tina, but I saw the questions and just decided to respond). I started making soaps last May and love it! 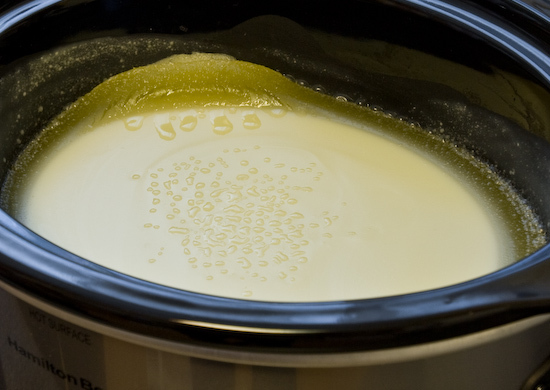 You can use milk instead of water, but the steps needs to be modified since the milk will cook and may affect the consistency/texture of the soap. Unfortunately I don't have any experience with hot process soap using milk but perhaps Elizabeth can share her recipe? What kind of vegetable oil is it? If it's soybean oil (most common vegetable oil) then it is included in the lye calculator. Overtracing the soap doesn't affect the end result - it just makes it harder to pour and smooth out. The soap is fine to use. When I'm mixing the soap using the stick blender, I also stir it in a figure 8 motion so I can feel the consistency of the mixture. Once it turns from transparent to opaque and I start to feel it becoming thicker, I stop every few seconds to check if the drippings from the blender leaves a pattern on the surface of the mixture. When it does, I stop blending and pour it into the mold. As usual, practice makes perfect - I'm sure you'll get the hang of it after a few tries :). I loved this recipe! Freeze your goat milk in a plastic ice cube tray until slushy and then add your lye very slowly. THis will keep it from heating up too quickly. After trace add your essential oil and the tablespoon of almond oil. Cure for 4 weeks. No temperature was given for the oils or milk lye mixture. Enjoy! IF you don;t have goat milk you can use any milk you have at home. Elizabeth, thank you for sharing the Goat Milk Soap recipe since, I was trying to find the recipe. I have a question. Do I have to use the essential oil? What happens if I don't use it? Can I still make a soap? One more question. Is the soap very creamy and moisturizing? I have a kind of dry skin. YOu will love this soap! It is very creamy. I suggest goat milk, that will turn out even creamier. It is ok if you don't have the essential oils. The milk will turn a light brown color. If you add the lye slowly, it shouldn;t change colors so fast (some people prefer white soap).I have another one with oatmeal. I will try to dig it up and post it here. Enjoy! Is there a difference between palm kernel oil and palm oil? If so, can I use the same amount of palm kernel oil for the receipe you provided? I live in Silicon Valley and the closest thing I could find to palm oil is at Whole Foods which carries shortening; I believe the ingredient was mainly palm oil. Any other recommendations on where I can buy palm oil? I was planning to use stainless steel muffin pans as molds for some soap. Do you knowif I can line it with paper muffin cups to make it easier to get out? Will it be difficlt to remove the paper? Do I need to remove the paper to cure the soap? I was planning to use the CP method. I am just starting to make soap myself. I am interested in hot process but so far have only been using cold. I am finding palm oil at Wholefoods market and some of the larger Ralphs supermarkets. Wholefoods also carries jungle shortening which is a little more expensive. I have been looking in Asian groceries, and I'll bet if there are Indian or Asian markets in your area they might carry both coconut oil and palm shortening. I have been making soap for a while now, and have had good success using aluminum molds for hot process soap. I have a number of old aluminum jello molds that make very attractive soap. I just use a damp sponge to rub off the "Jello" trademark when I unmold the soap. Some of the molds are so old that the Jello word still has a hyphen in it as it did years ago. Also, a hint for getting soap out of PVC pipe. 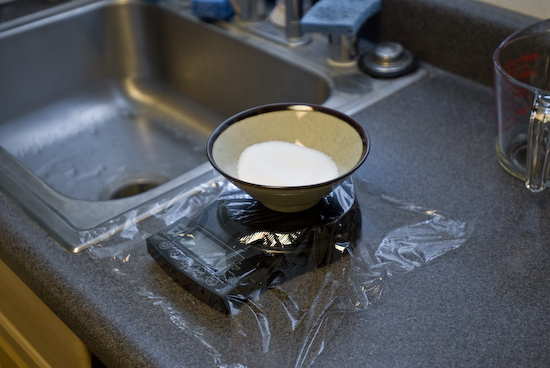 If you use a 3" size, just put a can of soup or milk on the counter and lower the pipe of soap over it. The soap will push right out the top. Just don't push the can all the way into the pipe! In my area of NM, the Smith grocery and Sunflower market both carry a brand of vegetable shortening that is palm oil. Somewhat expensive, but unless you are making mass quantities of soap, it is cheaper than paying for shipping. If you aren't hung up on all vegetable soap, I have found that lard makes a very similar product at much less expense in my recipes. Thanks for a very nice site! Excellent article, very clear and well written! And great photos too. Thanks so much for simplifying this tricky topic. I have enjoyed all your related soap posts. Can u use rosemary extract as a preservative in soaps? If so, how much and do u add it like u would FO? Thank u so much for all the info and teaching. wow thanks so much for the detailed descriptions and pictures really helped me to make my first batch of hot processed soaps! Hey Tina how are you doing? I was wondering have you done any new soap blogs? I just made my 1st soap HP and it was 16oz of olive oil and 16oz coconut oil. I douled the coconut oil by error. Can I used this soap and remelt it and double the rest of the ingredients and save the batch.It is very oily and did not set after the 2 hours. I actually have a question for you. Is there a reason you use coconut and palm oil, I guess actually the palm oil would have no smell, but does the coconut oil? I do not like the smell of coconut so was wondering if there is any substitutes? Looking forward to starting with the cold press soaps first and then going on to the hot press. Thank you for all the information. The coconut oil has no smell… this recipe makes unscented soap unless you add essential or fragrance oil to it. Coconut oil is important in soap recipes because it provides lather/bubbles, and palm oil provides firmness. I have a problem with my lye in that it comes in plastic containers that carry a static charge, or the lye does, and the lye flies out of the containers when I pour it. I've tried a few ways of dispelling the charge but it never seems to work (touching to metal, using a dryer sheet, etc.) Have you ever had this happen? It's dangerous to even get a few grains of it on your skin, and it flew all over the kitchen counter once and into some food. I should probably just dump it in a large glass jar if I can find one. Thanks for your site, I use your first recipe a lot! I love all the info here. Can I use goat milk in hot process soap? Thanks for these instructions that leave out the suggestion to test your soap by seeing if it zaps your tongue. I made some soap and linked to your blog from mine.